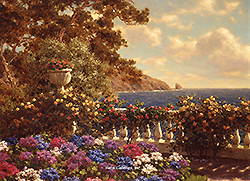 Ivan F. Choultse’s ability to capture light as it bathed a Mediterranean garden or skated across a snow filled landscape is what separated Choultse from many of his contemporaries. Choultse’s manipulation of light gives his work a bizarre and fantastical mood which few artists can achieve so naturally and skillfully. Born in Petrograd in 1877; he received his first formal art training from Czar Nicholas II’s celebrated court miniaturist Krijitski. Choultse’s artistic popularity dates from his first exhibition at the Academie des Beaux-Arts, Petrograd, in 1903. Following this noteworthy debut, he not only became an honored exhibitor at all the major galleries in Moscow and Petrograd, but was also elected court painter to Czar Nicholas II. 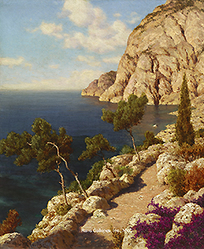 With this newly earned success, he was encouraged to travel abroad to explore a varied array of landscapes. Traveling throughout Europe, Asia, North Africa and the Arctic regions he was able to devote a considerable amount of time to the study of nature and the characterization of her light. After the Russian Revolution of 1917 Choultse, because of his ties to the Czar, felt obliged to leave Russia and soon established residency in Paris … where he began to exhibit and would received a number of awards and honors. In 1923 he displayed his first work at the Salon des Artistes Français where he not only attracted great attention but was ranked among the most prominent Salon artists. Demand for his work was increasing and his first one-man show in Paris, held at the Galleries Gerald Freres, sold out on opening day. Similar success was seen at his first one-man show in London, where all his works sold within the first six days. …the most perfect expression of nature seen from an open window in which light is depicted with a strength and reality never before equaled … and that which fascinates above all is the freshness and harmonious strength of his colouring. John Levy Gallery held an exhibition of his work in 1931 and described his snow scenes as: …brilliant and beautiful as that aspect of nature herself. 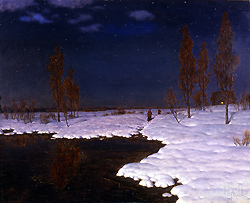 New York’s Hammer Galleries held a jubilee exhibition of 150 Years of Russian Painting in 1935 and described Choultse’s reputation as: …beloved among American collectors as a great master of snowy landscapes gilded by slanted sunbeams. Throughout his life Choultse was appreciated universally as a brilliant and analytical portrayer of nature. A London Times article summarized his aesthetic achievements perfectly when they stated: It must be seen to be believed.